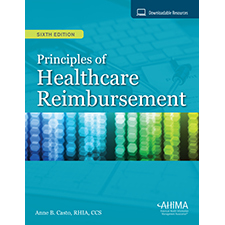 The sixth edition of Principles of Healthcare Reimbursement gives educators, students, and healthcare professionals comprehensive, up-to-date information on healthcare reimbursement systems, and the impact each system has on the entire US healthcare delivery system and economy, in one trusted source. In addition to describing healthcare reimbursement methodologies and systems, this text discusses the impact of health insurance, coding and billing compliance and value-based purchasing initiatives. New and future healthcare professionals desiring to work in healthcare finance, revenue cycle, compliance and coding will gain the knowledge and training they need to succeed.